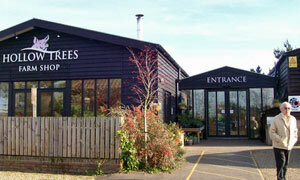 Woodlands Coffee Shop is part of Hollow Trees Farm shop which is at Semer in Suffolk. The farm shop has been in existence for years, although now in a new building, while the coffee shop is a relatively recent addition. This reviewer has visited several times now, and is always impressed with the food and service. The cafe contains several tables while in the corner there are some easy chairs which can be used with a smaller table for food or drinks or while waiting for an empty table, and an outside area which is lovely in the warmer weather. Today we had to wait for several minutes before we could sit down. The place is very popular and often there are small children there with their Mums. On this occasion I had carrot and parsnip soup with a chunk of wholemeal bread and butter. Their soup is wonderful - thick thick thick with a lovely taste and some chunks of carrot and red hot to boot. My husband had Stilton and bacon quiche which came with salad and coleslaw, and was judged to be "very tasty". The youngest member of our little group (who had stated his preferences on the way there) had a child's cheese sandwich which arrived with some crisps, a chocolate milk shake and most of the icing off one portion of chocolate cake which we shared. The cakes on display always look great. He likes the waitresses (and one particular one!) in their pink aprons who are very pleasant. Service is swift and thoughtful, with a smaller beaker brought out for the milk shake drinker in our midst. There are lots of options on the menu with daily specials which are all reasonably priced. Once we bought some cupcakes decorated with little pigs from the counter which were nice but haven't seen any lately unfortunately. So thus refreshed, a stroll round the shop with its vegetables, jam, Christmas cake display (at least at the moment), chilled food, and lots of other things, and a dinky little watery stream in one corner where a lone goldfish has been sighted once or twice, and time to emerge into the rural surroundings of the car park. One (not meant to be) amusing notice on a wall is for "Less Able Parking" which I really think is aimed at me. If it was a car -- Mercedes A Class. If they were passing by -- Clarissa Dickson Wright.